The modern villages of San Estevan and Progresso, Belize, are located on and around archaeological sites. Ancient Maya material culture is a daily reality for village residents, yet residents claim no ancestral or ethnic ties to the archaeological remains. This essay reflects on the experience of conducting archaeological investigations in these two non-descendant communities, and on efforts at public engagement during the course of research. It shows the evolving views of one archaeologist as she seeks to decolonize her future research practices. Key words: Belize, Maya, communities, decolonizing archaeology, public archaeology. Las aldeas de San Estevan y de Progresso, Belice, están situadas en y alrededor de sitios arqueológicos. Los materiales culturales antiguos mayas conforman parte de una realidad cotidiana para los residentes de las aldeas, sin embargo, los residentes no tienen vínculo ancestral o étnico a los restos arqueológicos. En este ensayo se reflexiona sobre la experiencia de hacer una investigación arqueológica en las dos comunidades nodescendientes, así como sobre los esfuerzos de participación pública en el transcurso de la investigación. Se muestra la evolución de las ideas de una arqueóloga que busca descolonizar sus prácticas de investigaciones futuras. Palabras claves: Belice, Maya, comunidades, descolonización de la arqueología, arqueología pública. The influence of postcolonial theory has brought attention to the ways that archaeology contributed to, and benefited from, Western colonial policies and structures (Gosden 2001; Liebmann and Rizvi 2008). With recognition of our discipline’s history of "scientific colonialism" (Nicholas and Hollowell 2007; Zimmerman 2001), some archaeologists have set out to decolonize archaeological practice (Apffel-Marglin and Marglin 1996; Atalay 2006; Nicholas 2008; Nicholas and Andrews 1997; Smith and Jackson 2006; Smith and Wobst 2005; Tuhiwai Smith 1999). Decolonizing archaeology entails the recognition of the colonial structures that have shaped our discipline, and actively working to subvert such structures. This often takes the shape of redistributing power, so that decisions about the subjects, methodologies, and interpretations of archaeological research are made by local or descendant communities, rather than exclusively by the archaeologists. There is a growing body of work devoted to collaborative and cooperative relationships, and ongoing dialogues between researchers and indigenous or descendant populations (e.g., Colwell-Chanthaphonh and Ferguson 2008; Kerber 2006; Marshall 2002; McDavid 2002; Moser et al. 2002; Silliman 2008; Stoughton 2006; Watkins 2000, 2003). Yet in many places in which archaeology is done today, local people do not claim an ancestral connection to ancient inhabitants (e.g., Hutson 2010; Pyburn 2003; Watkins et al. 2000; Parker-Pearson and Ramilisonina 2004). Such is the case in much of Latin America, where processes of epidemic disease, colonization, migration, forced resettlement, and national, political, and intellectual discourses about mestizaje (a "mixed" Spanish/indigenous ethnic identity) have created a disconnect between pre-Columbian/ historic peoples and contemporary populations. Archaeologists seeking to decolonize archaeology aim to correct the power imbalances of our discipline left over from colonial structures. These imbalances get played out in non-descendant communities in Latin America and elsewhere. While completing my dissertation research, between 2001 and 2003, I spent every summer living and working in two non-descendant communities in northern Belize as an archaeologist. Each summer I did some public archaeology, explaining our research goals and excavation results, allowing local residents to see and touch our finds. In the years since completing this research I have thought back to my work, and have observed the growing field of community archaeology and scholars seeking to decolonize our field. This essay is a critical reflection on my experiences, with an eye toward changing my practices in future research, and considering the challenges of decolonizing practices in non-descendant communities. At the same time, I recognize my own colonial gaze and the paradox of discussing decolonization without yet collaborating with local communities. I have framed much of this essay in the first person, in an effort to avoid speaking for the communities about which I write. In this article, I briefly discuss the two Belizean communities (figura 1) in which I worked and lived while completing my archaeological research. I argue that even though residents self-identify as neither indigenous nor descendant, there are important heritage needs in these communities. Finally, I explore the challenges to changing my archaeological practices in light of these heritage concerns. San Estevan is one of many communities in Latin America located on top of pre-Columbian or historic-period archaeological remains. Until the Belize Department of Archaeology intervened in the late 1990s, the monumental core of the Early Classic Period site of San Estevan was bulldozed for road fill. The streets of San Estevan are quite literally paved with Maya temples. Archaeologists have worked intermittently at and around the village since the 1960s (Bullard 1965; Hammond 1973, 1975; Levi 1996, 2002, 2003; Rosenswig 2007, 2008). In addition, San Estevan has served as the home base for archaeological teams working at Progresso Lagoon, Honey Camp Lagoon, and Pulltrouser Swamp. Archaeological remains are part of residents’ everyday lives. Archaeological research and archaeologists are woven into the social and economic history of the community. Figura 1. 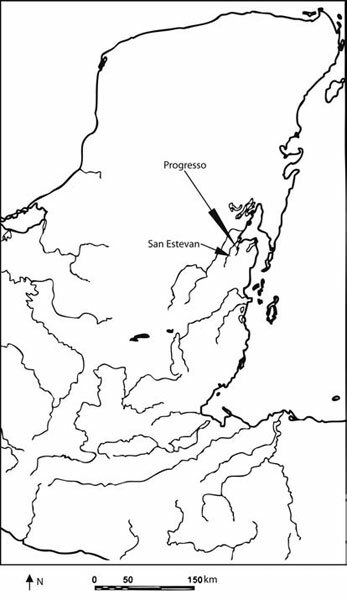 Map showing the location of Progresso and San Estevan, Belize. Mapa que muestra la ubicación de Progresso y San Estevan, Belice. The village of Progresso was also built adjacent to Maya ruins. The town itself was established during the Caste War of Yucatán (AD 1847-1901), and has remnants of architecture dating to this period (Masson 1998). Between 1997 and 2003, archaeologists completed survey and excavation along the shores of Progresso Lagoon, and on Caye Coco, the largest island in the lagoon (Delu et al. 2002; Ferguson et al. 2003; Masson and Rosenswig 1998, 1999; Oland and Masson 2005; Rosenswig and Masson 2000, 2001). Although we worked with the consent of landowners and hired some laborers from Progresso, in other ways archaeologists avoided local community relations with Progresso. Between 1997 and 2002, the archaeological project was based in the town of San Estevan, and archaeologists commuted to the outskirts of Progresso for research. Research was conducted on land just south of the town center, on the island of Caye Coco (the site of a homestead farm), and on agricultural fields (primarily sugarcane) owned by Progresso villagers. Between 2000 and 2003, much of the research was conducted on fifteenth- to seventeenth-century Maya remains, which were located on large estate properties owned by outsiders (American, Jamaican, and Belizean). The acquisition of lagoon property by non-local owners has increased in recent years, and complicates community relations and politics. In 2002, the project held an outreach Museum Night in Progresso, and in 2003 the project based its living quarters in the village. The movement of the camp to Progresso in 2003 was extremely successful, and members of the community seemed to appreciate the money that we spent there for archaeological and domestic labor, rent, food, and other supplies. Nonetheless, this economic impact was not sustained, as no archaeological research has been undertaken at Progresso Lagoon since 2003. Many residents of San Estevan and Progresso are interested in the ancient artifacts and altered landscapes that are spread across their yards and fields. My colleagues and I have been approached many times to look at mounds and artifacts, particularly obsidian blades, ceramic or stone beads, and fragments of ceramic effigy-style incense burners. Archaeological remains are sometimes collected, much as residents of my New England town will collect fragments of nineteenth-century pottery or glass from their own backyards. On the one hand, archaeological remains are curiosities. On the other, archaeologists and heritage organizations like the UNESCO World Heritage Committee have argued for decades that archaeology, particularly prehistory, belongs to everyone (and that its loss is a detriment to all of us) (e.g., Brodie and Renfrew 2005). Some residents expressed pride that the ruins around their village were important to the scientific community, and to the study of the prehistory and history of the Maya people. This pride was evident when residents were given copies of field reports, in which landowners saw their own properties featured. The government of Belize has also tried to preserve its archaeological patrimony as a means of building a national identity. The government maintains and regulates archaeological sites through the Institute of Archaeology, National Institute of Culture and History, and argues that "the study [of] the past provides a foundation for our understanding of Belize’s Cultural Heritage" (Belize Institute of Archaeology n.d.). The past two decades have seen national investment in the infrastructure of Belize’s museums, Houses of Culture, and archaeological parks. If archaeology is part of nation-building and national pride, then having an archaeological site in one’s community can contribute to that national pride. Certainly this is not the case for everyone, as many populations are left out of the national story of multicultural diversity in Belize (see Medina 1997). Yet there is not a clear connection between the nation’s promotion of Maya archaeology as national heritage and contemporary ethnic identity. The work of the Maya Area Cultural Heritage Initiative (MACHI, now InHerit) has suggested that many contemporary ethnic Maya in southern Belize do not see archaeological sites as important to contemporary identity (Parks 2010; Parks et al. 2006). The government of Belize has to some degree succeeded in transforming Maya archaeology into national heritage, while keeping it distinct and distant from the thorny issues of indigenous Maya land rights and cultural patrimony in southern Belize. It is hard to avoid the association of archaeological sites with tourism in Belize. Over the past two decades, reconstructive work at Altun Ha, Lamanai, and Cerros has brought an increasing number of visitors to northern Belize. Residents are aware that in some places, whole villages have mobilized to serve the tourist needs of visitors on day trips from cruise ships (i.e. the village of Indian Church at the archaeological site of Lamanai). Why not Progresso Lagoon? While I conducted my dissertation fieldwork, I was repeatedly asked why I did not dig bigger mounds? Why didn’t I excavate something that tourists would want to come visit? Of course, the creation of archaeological tourist attractions is not as easy as digging large mounds. In Belize, archaeological tourism is primarily controlled by the aforementioned Institute of Archaeology, which maintains twelve archaeological parks across the country. Tourism industries (such as hotels, restaurants, and tour companies) have developed around these parks, but are not typically placed around undeveloped ruins (see Ramsey and Everitt 2008). Most ancient Maya sites remain on privately held land, and are unexcavated and unconsolidated. At Progresso Lagoon, many people anticipated that they would benefit from archaeological tourism. There was, however, some fear of land being taken away by the government of Belize if we did find anything of consequence (particularly among non-Belizean landowners). Others see artifacts as a source of income, and looting pits pockmark the region. As the illegal trade in pre-Columbian artifacts continues (Coggins 1969; Gilgan 2001; Pendergast 1991; Pendergast and Graham 1989), and may in fact increase in times of market volatility (see Pendergast 1991), some local residents engage in unauthorized digging to fill the demand (see Parks et al. 2006). Yet ethnographers have found that many local looters are "subsistence diggers": they loot archaeological sites to support their households because few other viable economic alternatives exist (Hollowell 2006; Hollowell-Zimmer 2003; Matsuda 1998a, b). The presence of archaeologists may in fact unintentionally encourage looting (Hollowell 2006:86) (although the opposite appears to be true among schoolchildren with access to archaeologists and archaeological research in Crooked Tree, Belize; Alicia Beth Ebbitt McGill personal communication August 2011). Archaeologists often swoop in for short seasons, train and pay local laborers to remove "important" artifacts, and then leave the community with few, if any, long-term economic benefits. Looters may see looting as a form of "economic justice" to take and sell these artifacts (Hollowell 2006:76; Matsuda 1998a:93). Why should archaeologists be the only ones to benefit from archaeological remains? Despite the law in Belize that all cultural heritage more than 100 years old belongs to the government, local people often feel that they have a right to harvest the artifacts from their own lands (Matsuda 1998a, b; Parks 2010). During the 2003 field season, my excavations were looted one night after we had left the site, although it is doubtful that anything of consequence was found. Other looter’s pits are scattered around the shore of Progresso Lagoon, and on Caye Coco. Whether these were placed in reaction to archaeologists’ presence in the area, or in response to the dire economic realities of many residents, they express a desire for archaeological heritage to be an economic resource, and a desire to be in control of this resource. When I designed my archaeological research in Belize, I did not consider the heritage needs of the communities in which I lived and work. My archaeological practice, however was influenced by Anne Pyburn and Richard Wilk’s (1995) idea of "Archaeology as Applied Anthropology." Their approach asks us to consider the role that archaeologists play in a community, and to act in a way that is responsible to the people amongst whom we live and work. For me, this has meant training staff and students to interact appropriately according to the norms of the village, and to respect the customs of our neighbors. When given this direction, I found that staff and students went above and beyond expectations, and made substantial efforts to participate in community life. It also meant recognizing the financial impact of our archaeological project on the community. When I came to the community with substantial grant funding, I was careful to institute equitable hiring practices. Members of the community were all given an equal opportunity to apply for work, and men and women were hired in the order in which they applied. Students and staff were also encouraged to patronize multiple stores in towns, as a way to more equally distribute the wealth that we brought with us. Inspired by the growing field of public archaeology, I sought a way to disseminate project information with our local communities while archaeological research was occurring. I began the tradition of Museum Night, during which staff and students would display and explain artifacts from the current season’s excavations to the local community. I gave lectures in English and Spanish about our goals, our methodologies, and our findings to date. Young children colored in pictures of artifacts. The village youth group sold drinks and snacks. Although it was simple, this was an attempt to present the community with the information I thought they needed to know. As an academic archaeologist, I did what was expected of me, and beyond, by engaging in the community. But when situated within the field of decolonizing practice, my work falls short. Although our large turnouts indicated an appreciation for our efforts, the power to create, interpret, and disseminate the history of this place rested solely with me. I did not plan my research around the archaeological interests of the local residents, nor did I ask them what they wanted to know. Because I worked amongst non-descendant communities, nobody (i.e. advisers, colleagues, the Belize government) expected me to collaborate with them in the investigation of the past. Decolonizing means creating a discourse and collaboration between researchers and communities, to fundamentally shift the relations of power. While this is increasingly expected in indigenous communities, it is far less often attempted in non-descendant communities. Laurajane Smith (2006:44) refers to heritage as "a cultural process that engages with acts of remembering… to create ways to understand and engage with the present." Put this way, non-descendant communities have as much right to engage with archaeological heritage as an ancestral or indigenous community. Mike Parker Pearson and Ramilisonina (2004) urge us to work with the local community rather than for any particular indigenous or ethnic group. They stress the possibility of meeting both the needs of the greater archaeological community and the particular needs of the local population, while avoiding reinforcing any one minority or dominant ideology. This approach entails a definition of heritage that is not tied to ancestral or genetic continuities, but which encompasses everything about the past that may be important to present-day peoples (Smith 2006). Some scholars (e.g., Chilton and Hart 2009; Hart 2009, 2011) envision local communities to be made up of multiple archaeological stakeholders defined as anyone with an interest in the heritage work done by and with archaeological remains. The concept of stakeholders helps to recognize the competing interests that may be represented by community members. What would a decolonized practice look like in my work? I would like to be part of the heritage work in San Estevan and Progresso: to collaborate with them, and to use my expertise in a way that is acceptable and beneficial to multiple stakeholders. This would require large investments in building relationships, and in researching the heritage needs and interests of stakeholders. It would be hard to accomplish the necessary level of communication and interaction within the confines of the busy two-month field season. Such an undertaking would require a much longer time period, many conversations, and perhaps a researcher dedicated to the these tasks. I can anticipate the challenges of such a project in San Estevan and Progresso, where divisions along political party lines, socioeconomic class, and other historical divisions will surely create distinct stakeholder interests (see also Ardren 2002; Breglia 2007). In addition, the two communities differ from each other, in income levels, ethnic background, and in the interactions they have had with archaeologists. When I return to my research, I will have to confront questions such as: is an archaeologist more responsible to the community one lives in, or the community one excavates in? With a regional project, it is likely that excavations will take place in various locations throughout the years. Yet heritage needs are likely to be more local than regional. Furthermore, I anticipate that the heritage needs of the communities will be different from my research goals. I do believe that local residents of Progresso and San Estevan are interested in archaeology as an intellectual pursuit. Turnout was always large at my public events. People asked questions about how ancient people lived in Belize, and how artifacts were used. There seemed to be pride associated with being part of a regional and national cultural heritage. On the other hand, the economic reality of most rural Belizeans surpasses the academic interest of an educated public. My observations suggest that local residents are interested in harnessing archaeological resources for economic benefit. While some residents have turned to subsistence digging to supplement their income, many others look to the significant impact that archaeological tourism can have on a local economy. As an academic archaeologist, I am uncomfortable engaging in archaeology solely for the purpose of attracting tourists, particularly knowing the profound and unexpected changes that have accompanied tourism in other Belizean communities (see Medina 2003). San Estevan and Progresso are like so many other communities around the world, where residents live amongst the archaeological past, but do not claim to be the ancestors of the previous inhabitants. In this essay I have proposed a focus on local heritage needs, but anticipate the challenges of engaging with a multivocal and diverse public. The questions looming over my future work are many, and I am sure that such a decolonizing project is much more complicated than I have imagined. Yet if we are to move beyond the colonial constructs of our disciplinary history, it strikes me as important to start taking the heritage needs of these communities seriously. Acknowledgments: My research in Belize has been made possible by the Belize Institute of Archaeology, under the direction of John Morris, George Thompson, and Jaime Awe. Field research was accomplished with support from the Belize Postclassic Project and the SUNY Albany Field School, directed by Marilyn Masson, the National Science Foundation Dissertation Improvement Grant (#0315331), a dissertation grant from the Wenner-Gren Foundation for Anthropological Research (#7055), and Northwestern University. I am incredibly grateful to the people of San Estevan and Progresso, Belize. I thank Alicia Beth Ebbitt McGill, Elizabeth Klarich, Siobhan Hart, Cameron Griffith, and Reiko Ishihara-Brito for their comments on earlier versions of this paper. * Artículo seleccionado del conjunto de ponencias presentadas en el Simposio Shifting from Object-centered Research to People-focused Application: Current Approaches to Public Archaeology from Latin America and the Caribbean, realizado en el marco de la 75 reunión anual de la Sociedad de Arqueología Americana, Saint Louis, Missouri, EUA, abril 2010. Este manuscrito fue evaluado por investigadores externos y editado por Reiko Ishihara-Brito y Cameron Griffith, en su calidad de editores invitados de la Revista. Brodie, N., and C. Renfrew 2005. Looting and the world’s archaeological heritage: The inadequate response. Annual Review of Anthropology 34:343-361. Ferguson, J.M., M.H. Oland, and M.A. Masson (eds.) 2003. Belize Postclassic Project 2002: Investigation of the Shore Settlements of Progresso Lagoon, and San Estevan. Report to the Department of Archaeology, Belmopan, Belize. Institute for Mesoamerican Studies Occasional Publication Nº 9. The University at Albany-SUNY, Albany, New York. Gilgan, E. 2001. Looting and the market for Maya objects: A Belizean perspective. In Trade in Illicit Antiquities: The Destruction of the World’s Archaeological Heritage, edited by N. Brodie, J. Doole, and C. Renfrew, pp. 73-88. McDonald Institute Monographs for Archaeological Research, Cambridge. Silliman, S.W. (ed.) 2008. Collaborating at the Trowel’s Edge: Teaching and Learning in Indigenous Archaeology. University of Arizona Press, Tucson. Stoughton, S. 2006. Community archaeology: The Kitikmeot Heritage Society’s Iqaluktuuq Project. Totem: The University of Western Ontario Journal of Anthropology 14(1):83-90. Recibido: octubre 2010. Aceptado: abril 2012.